Hello NairaBettors and intending affiliates, Good day, Today we'll be looking at the Nairabet affiliate program and how both gamblers and affiliate marketers and can make money from NairaBet without placing a single bet or losing their hard earned money. How to withdraw earnings e.t.c. The NairaBet Affiliate Program gives you the chance to earn loads of money risk-free and their generous reward plan allows you to keep on earning for up to 3 months on each person you refer. Get new members to sign up or join NairaBet through your affiliate link, Register A Nairabet affiliate Account HERE to get your Nairabet affiliate link. Once a member signs up using your affiliate link, the member is tied to you, and you can view the progress of your affiliate campaign on the 'Statistics' page. For every member you invite, you are paid 50% of their net revenue from each person you refer at the end of 31 days. That means you get 50% of whatever profit NairaBet makes from each new member that signs up under you for the next 31 days. Here is an example: You refer Mr. X, who deposits 5,000 Naira into his NairaBet account. He then places bets worth 2,000Naira and loses it all. At this point NairaBet's profit from Mr. X is 2,000 Naira and a profit of 1000 Naira is recorded for you against the Mr. X on the 'Your Profit' page. If next this Mr. X places a bet with 1,000 Naira and wins 4,000 Naira, their net revenue from him goes into the negative and your profit from him becomes 0.00. If Mr. X plays and loses again then, your profit from him begins to rise again. At the end of every month payment period, your NairaBet would be credited with the final profit (If any) you have made from Mr X, and that would be recorded on the Payout page. Note: Profit calculations take withdrawals, and pending bets into consideration. To start making money with this programme, all you need to do is to Register On NairaBet affiliate portal HERE. Every registered member of NairaBet affiliate portal is already an affiliate and can start referring new members immediately. After Registration, Click on "Account" to get your affiliate link. Get new members to register via your personalized affiliate link, and they'll be added under you. Cookies last 40 minutes and cannot be changed. Your views and registrations will be updated close to real time. Payout statistics are updated 31 days after sign up of the new customer. 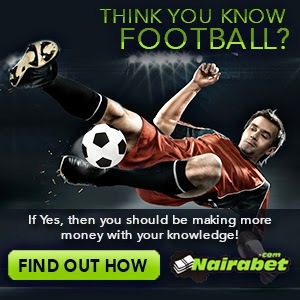 Your affiliate earnings would be credited to your NairaBet account at the end of 31 days referral period. You can track your credits on the 'Your Payout' page, and track your current profit on the 'Your profit' page. You are not mandated to place bets with your affiliate earnings. Your earnings would be sent to your Bank Account. What's the minimum or maximum amount I can get paid? There are no amount restrictions on affiliate payouts. You get exactly 50% of their earnings from the customer no matter how much or little the amount is. If at the end of the 31 days period, they have negative net revenue, and then you'll earn no affiliate commission as no profit was made from the customer during that period. Nairabet will be paying you every month as long as you invite more customers to them and note that, the more your referral lose, more money for you. Example: If you invite 10 people to nairabet with your affiliate link, lets assume those 10 people fund their account with N1000 each,that's N10,000. They now lose the N10,000, at the end of the month Nairabet will give you N5000. - That's the logic. Moreover, More money for you if you have a blog, you can use the affiliate banner on your blog. With this affiliate program any serious affiliate can make huge cash monthly by simply referring bettors, the logic is simple and you will always make profits, trust me!! Having Issues? Kindly Drop All Questions And Testimonies on the comments section Below. Continue to enjoy my blog and read other interesting and related updates for more!